This is a bit of a signature Rainer Schlegelmilch shot- framed through the engine cover of another team car in the Brands pitlane- that of Pedro Rodriguez and Jackie Oliver to be precise. 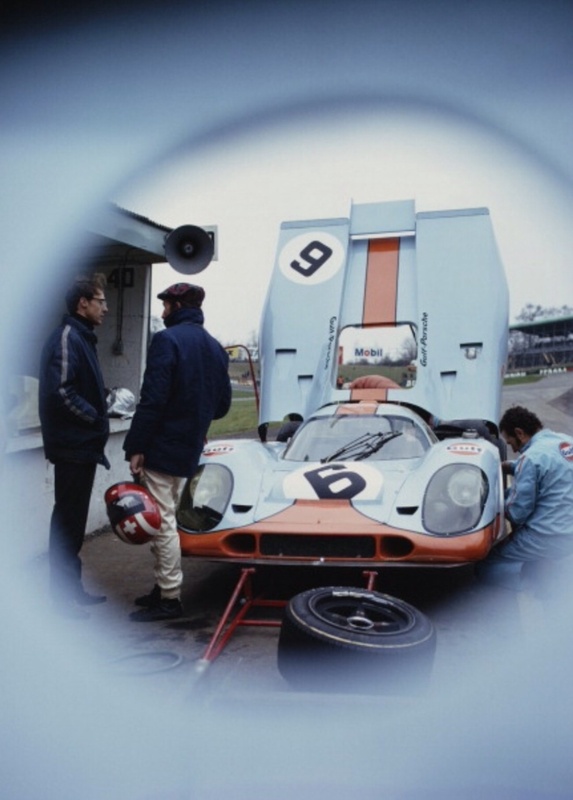 It was always going to be tricky winning in the 917 at Brands- and so it was that more nimble 3 litre prototypes finished in front of the Siffert/Derek Bell machine. 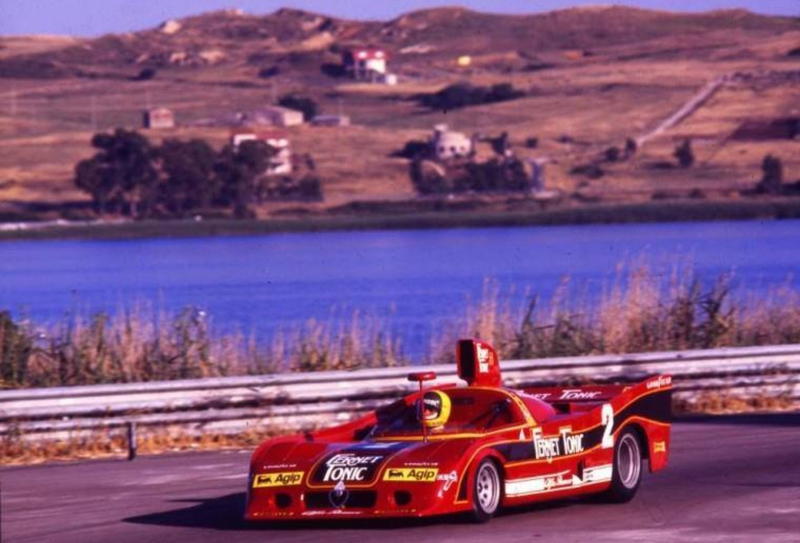 Andrea De Adamich and Henri Pescarolo won the race in an Alfa T33/3 V8 from the flat-12 engined Ferrari 312PB of Jacky Ickx and Clay Regazzoni. 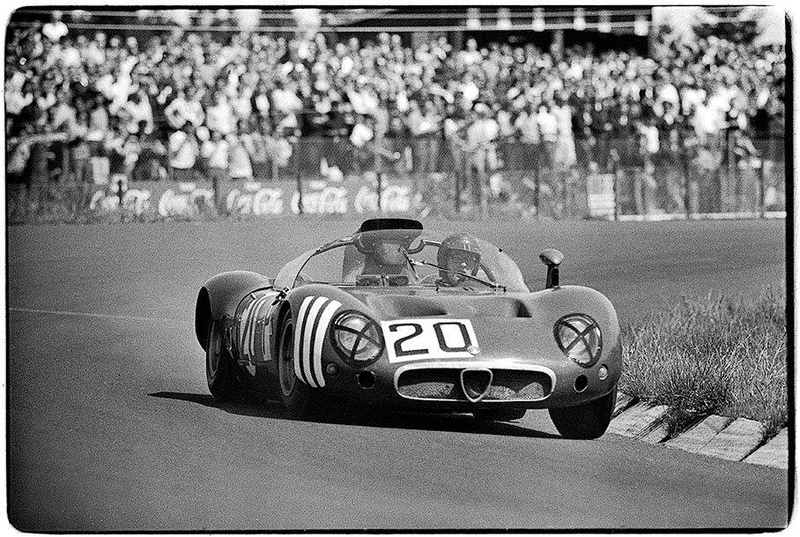 The Alfas were pretty pacey that weekend, Rolf Stommelen popped the T33/3 he shared with Toine Hezemans on grid 2 in addition to the efforts of the winning car. 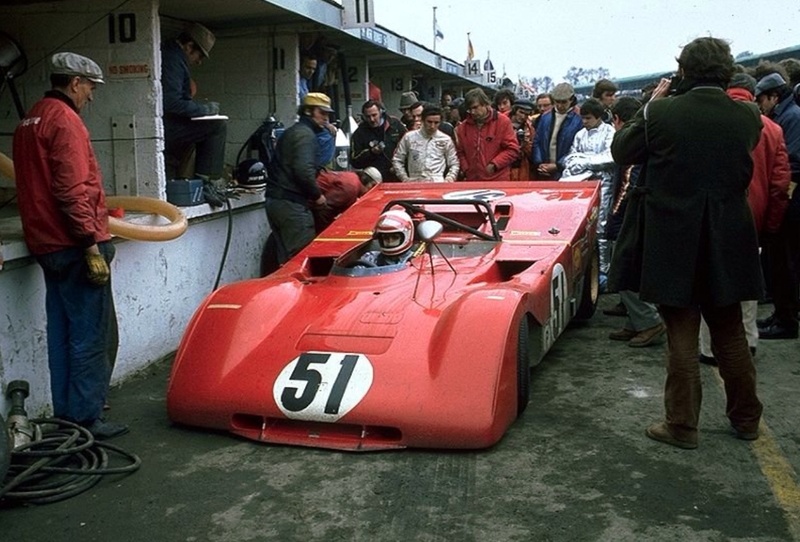 Ickx was on pole in the 312PB which had a limited campaign in 1971 as a dress rehearsal for the great pace the evolved 312PB had in 1972 when the cars won pretty much everything except Le Mans. They entered but did not appear such was the lack of confidence in the F1 derived engines ability to last 24 hours. 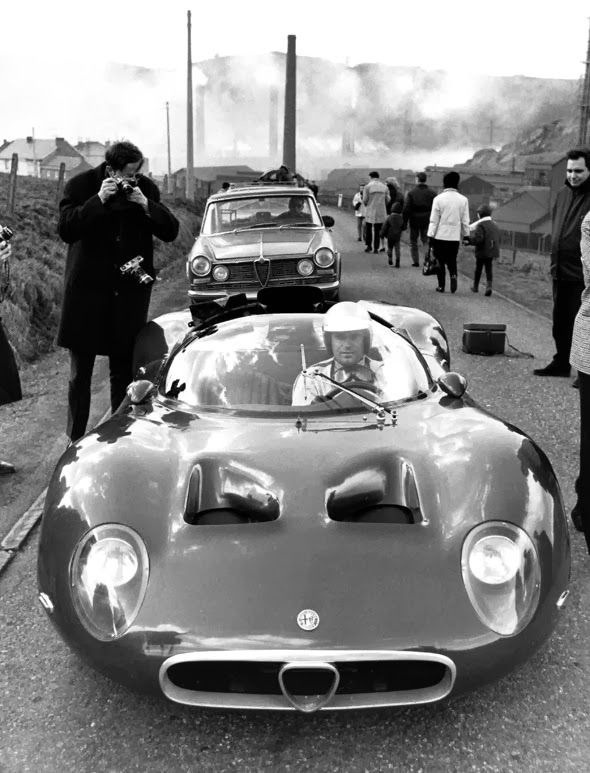 Regga aboard the 312PB whilst Ickx looks on from the rear. 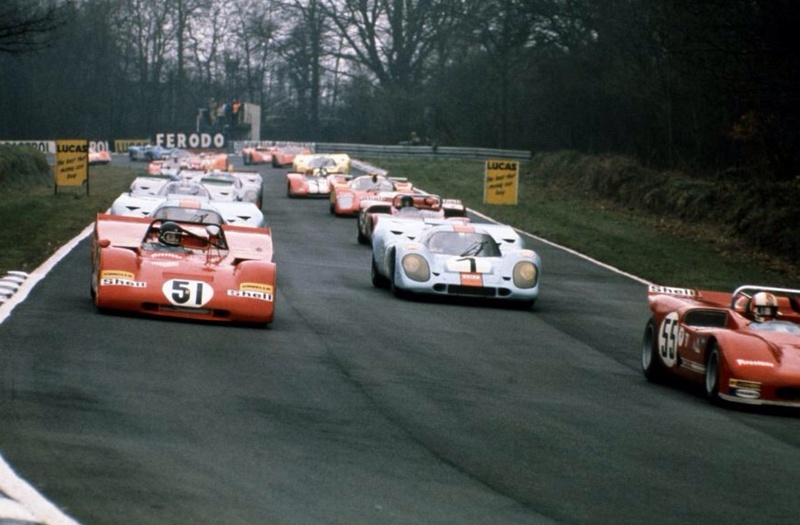 I always thought it a huge shame that Scuderia Ferrari didn’t race the 512M as a factory entry in 1971- it would have been great to see the 5 litre cars with both ‘factory teams’ going at it for the final year of the championship under those Group 5 rules. 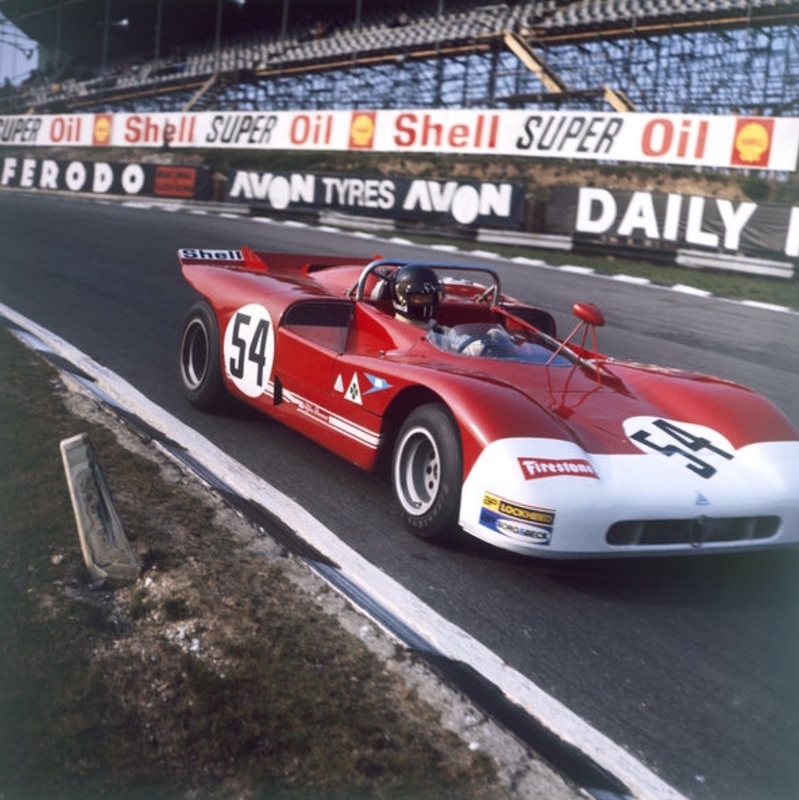 Ferrari certainly spent 1971 wisely developing their 312PB for 1972 however, dominant as they were in the first year of the 3 litre prototype formula. 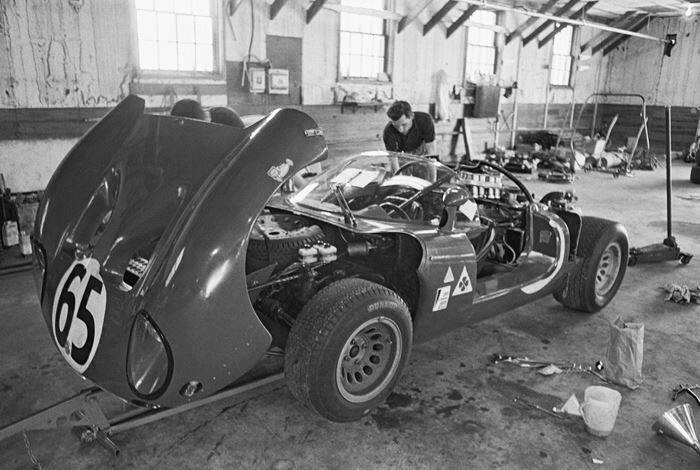 Carlo Chiti and his merry band at Autodelta built a really nice bit of kit in the 1971 iteration of their long running series of Tipo 33 sportscars. 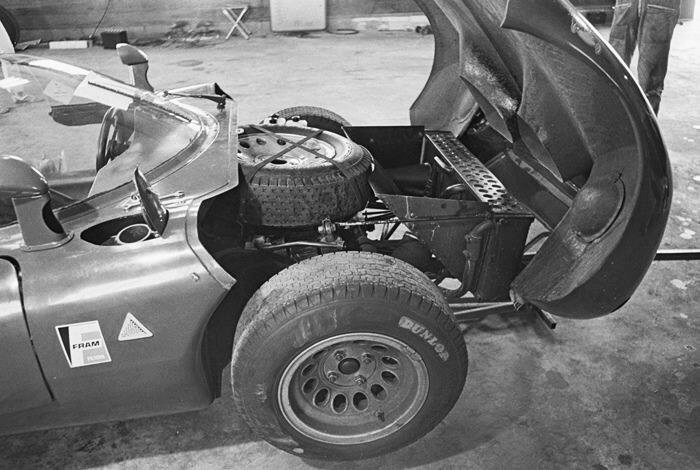 With an aluminium monocoque chassis, double wishbone/coil spring dampers at the front and single upper link, inverted lower wishbone/coil spring damper and twin radius rods at the rear the chunky looking design was an expression of sportscar orthodoxy of the time. The 90 degree all aluminium 2998cc, quad cam, 4 valve, Lucas injected V8 gave around 420 bhp @ 9400- and with a decent roster of drivers the car won Targa (Vaccarella/Hezemans), Brands and the season ending Watkins Glen 6 Hour (De Adamich/Pescarolo) in a very good year in which the 5 litre monsters again took the bulk of the wins, and Porsche the manufacturers championship for the second year on the trot. Thanks to Claudy Schmitz for identifying both the Royal Couple and Balocco as the correct venue, the power of Facebook! Whilst the Princess was born of Italian Royal blood it would be interesting to know the circumstances of this ‘test’ drive, the car definitely too small for their family of five! 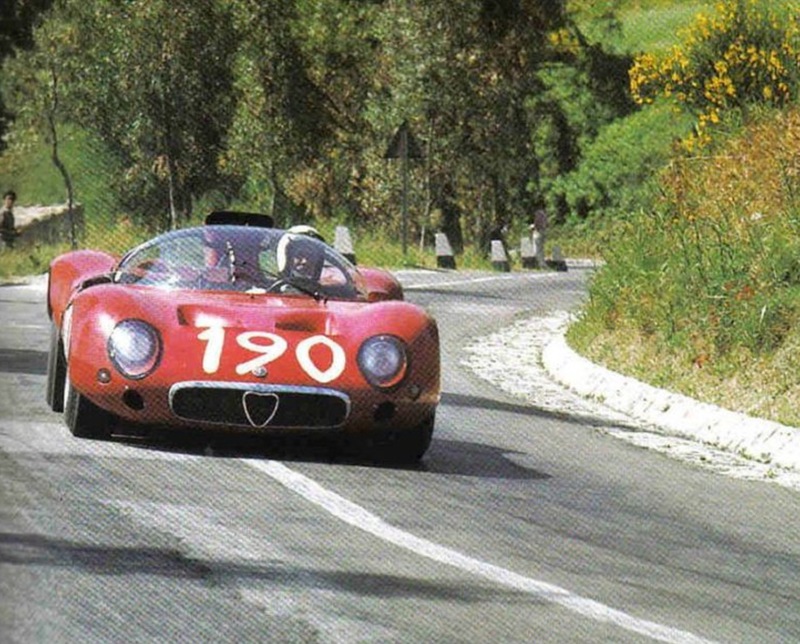 Alfa’s first mid-engined racer made its competition debut at the Fleron Hillclimb in Belgium on 12 March 1967, factory test pilot Teodoro Zeccoli took a win from some stiff competition. The 33 made its race debut at Sebring that summer on the weekend of 1 April. Andrea De Adamich lead the 12 Hour event’s first lap but both cars entered retired with suspension and overheating dramas. 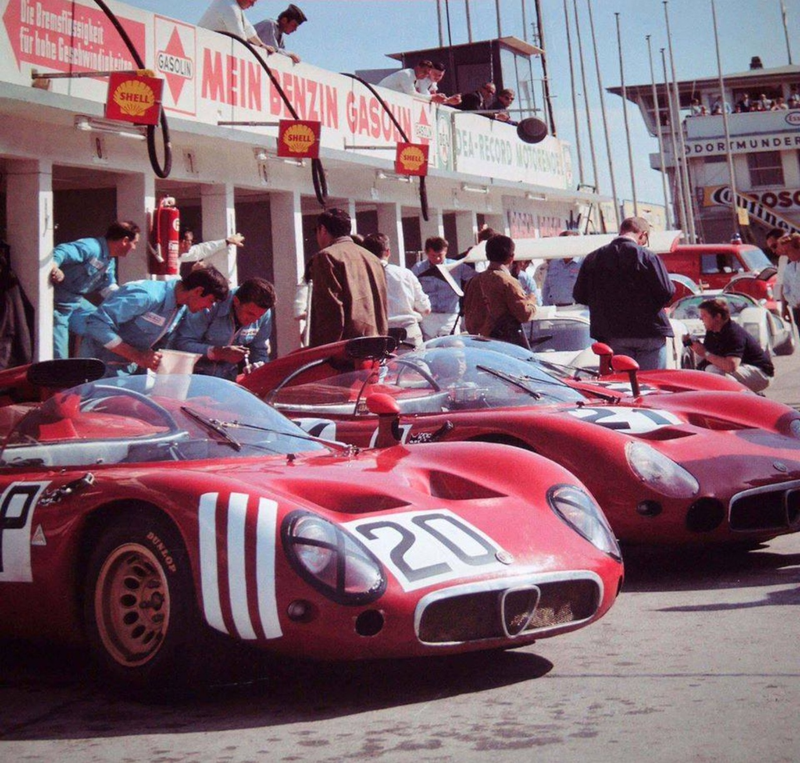 Here are some shots of the cars in the Sebring paddock; #65 is DeAdamich/Zeccoli, #66 Roberto Businello/Nanni Galli. 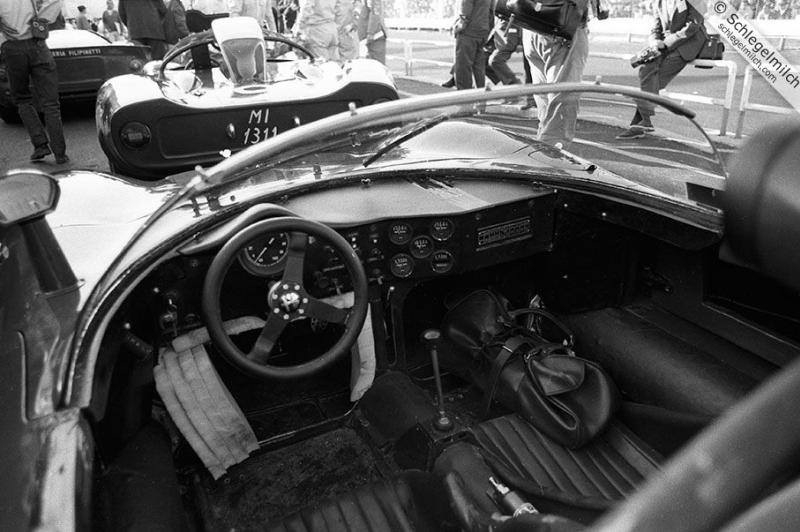 The race was won by the factory Ford Mk4 of Bruce McLaren and Mario Andretti. 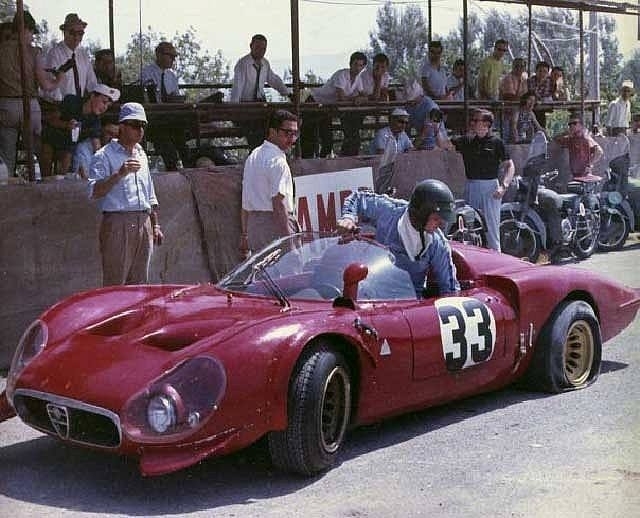 Four cars were entered at the Targa Florio, all failed to finish due to suspension (De Adamich/Jean Rolland Bonnier/Baghetti) and a minor accident involving the Geki Russo/Nino Todaro. 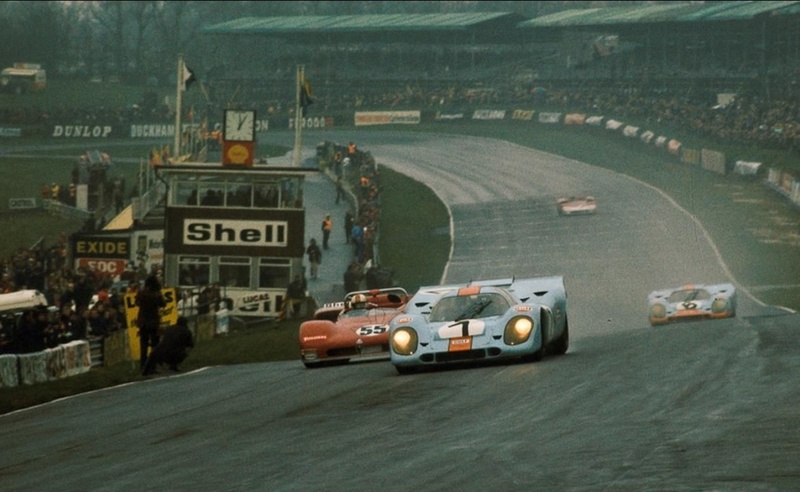 The race was won by the Porsche 910 of Paul Hawkins and Rolf Stommelen. 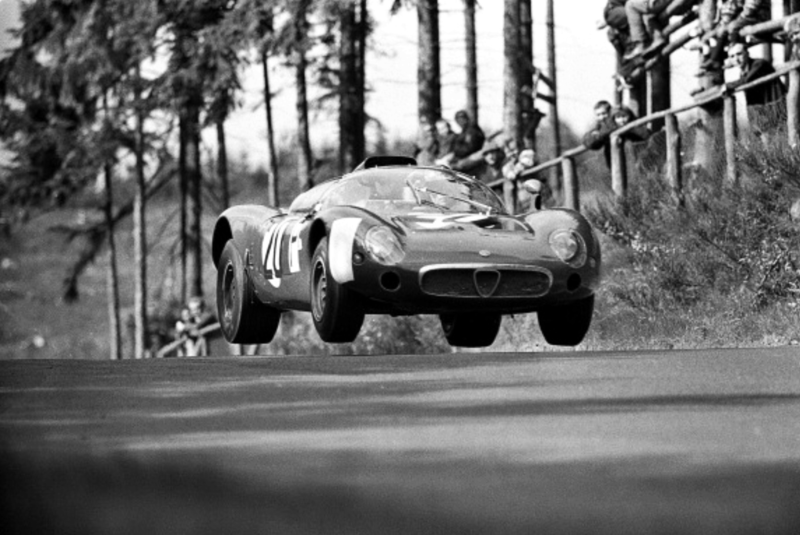 Nani Galli and Andrea De Adamich finally broke through for the team at the Nurburgring, they finished 5th in the 1000Km behind 4 Porsche 910’s. 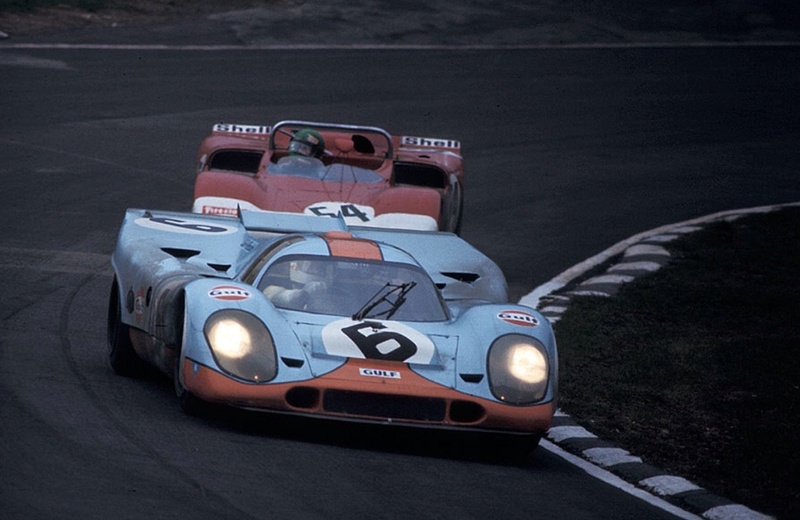 The winning Porsche 910 was driven by the combination of Joe Buzzetta and Udo Schutz. The De Adamich/Galli T33 had another suspension failure on lap 18, but they shared the other car driven by Businello/Zeccoli, the four drivers getting the joy of the cars first race finish. 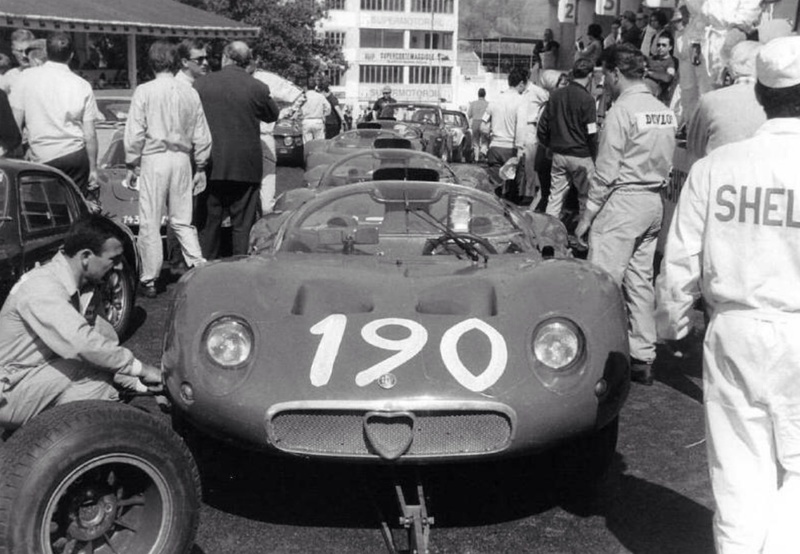 The ‘Periscopica’s’ final start for 1967 was the Circuit of Mugello in July, 8 laps of a tough 66Km road circuit. 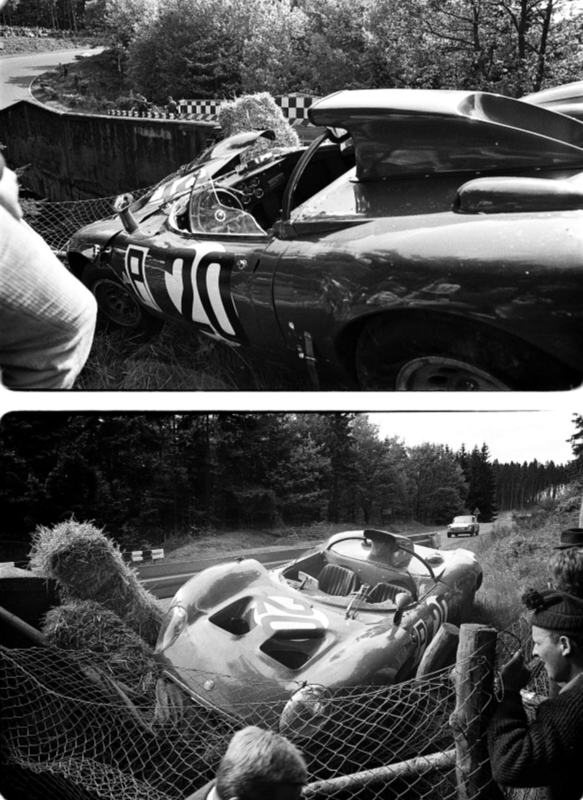 Udo Schutz and Gerhard Mitter won the race tailor made for the fast, light but tough Porsche 910. 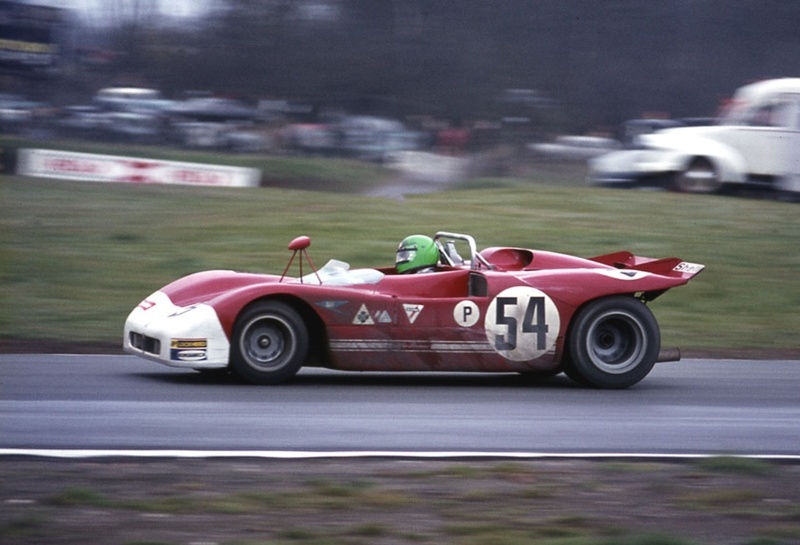 A privately entered GTA was the best place Alfa in 7th, the three Autodelta T33’s of DeAdamich/Galli, Lucien Bianchi/Giunti and Colin Davis/Spartaco Dini all failed to finish. It had been a patchy start but the Tipo 33 continually evolved over the following decade ultimately winning many races, sometimes not against the strongest of opposition, but ultimately winning the World Championship of Makes in 1975 and 1977. 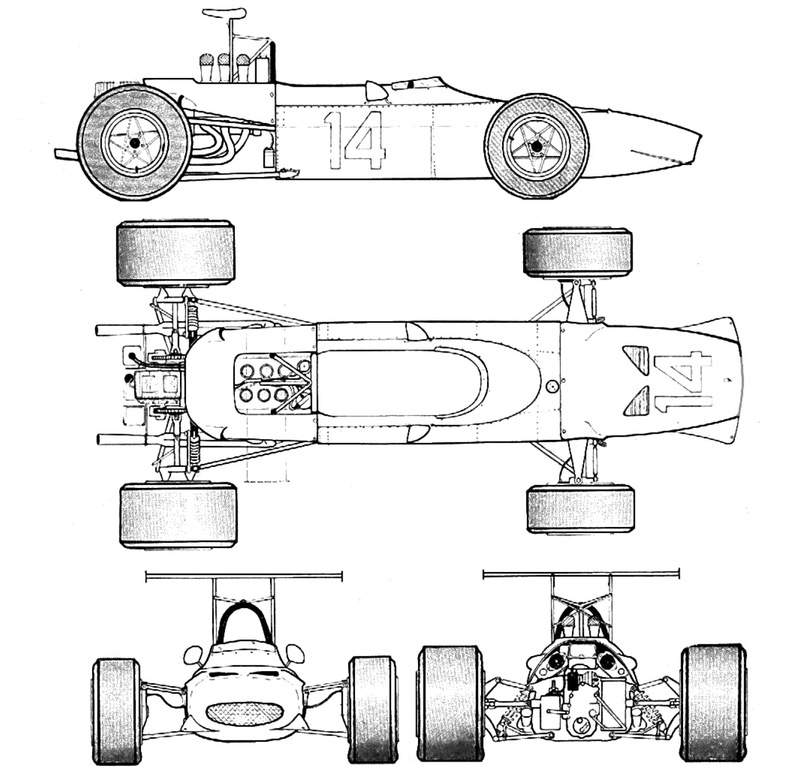 The T33 in its original guise had an unusual chassis design. 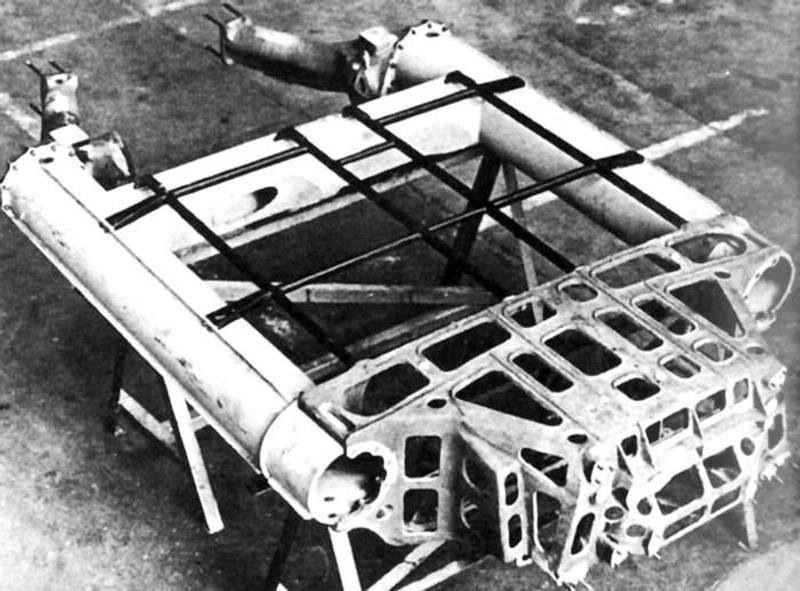 The main structure comprised two longitudinal aluminium spars to which was mounted a complex magnesium casting at the front, the front suspension mounted to it. At the rear the spars had a fabricated sheet metal saddle to which the suspension was attached. 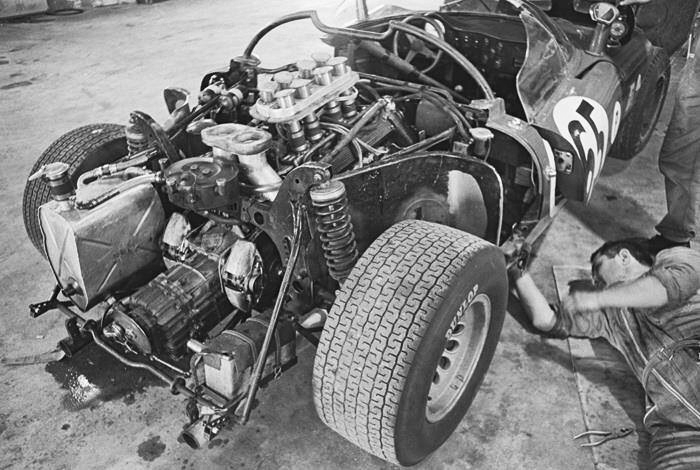 The suspension itself was conventional for the period; upper and lower wishbones and coil spring/ damper units and single top link, inverted lower wishbone and twin radius rods, coil spring/ dampers at the rear. Adjustable sway bars fitted of course. Uprights were cast magnesium, steering rack and pinion with Girling disc brakes front and rear. Weight 580Kg. 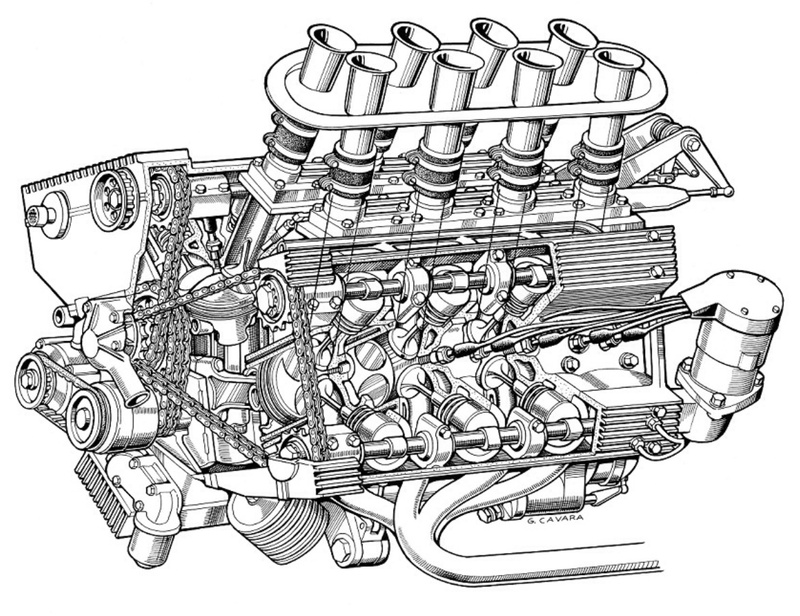 The heart of the early T33’s was of course it’s superb little all alloy DOHC V8. Initially 2 litres (1995cc) and 2 valves per cylinder, the cams chain driven, the Lucas fuel injected engines power output was a claimed 260bhp @ 9500rpm, the gearbox Alfa’s own 6 speed transaxle. Posted: July 9, 2014 in Fotos, Who,What,Where & When...? 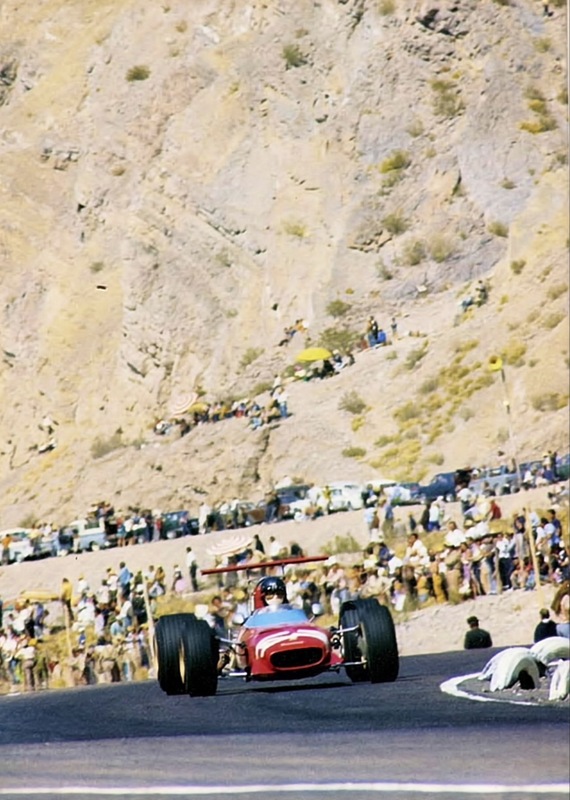 Sensational panorama of the San Juan circuit with the Andes as a backdrop. 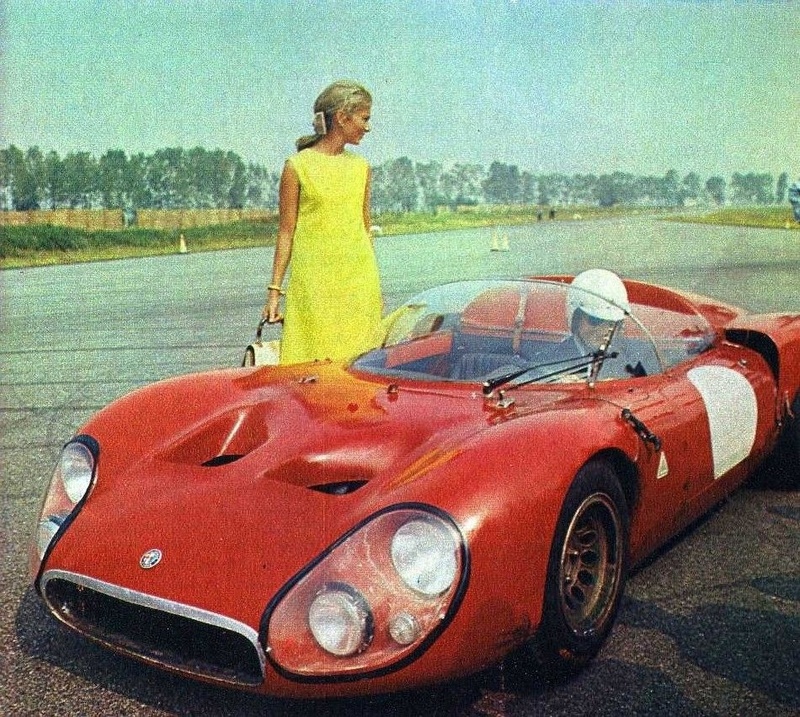 This race was won by the De Adamich Ferrari Dino 166. 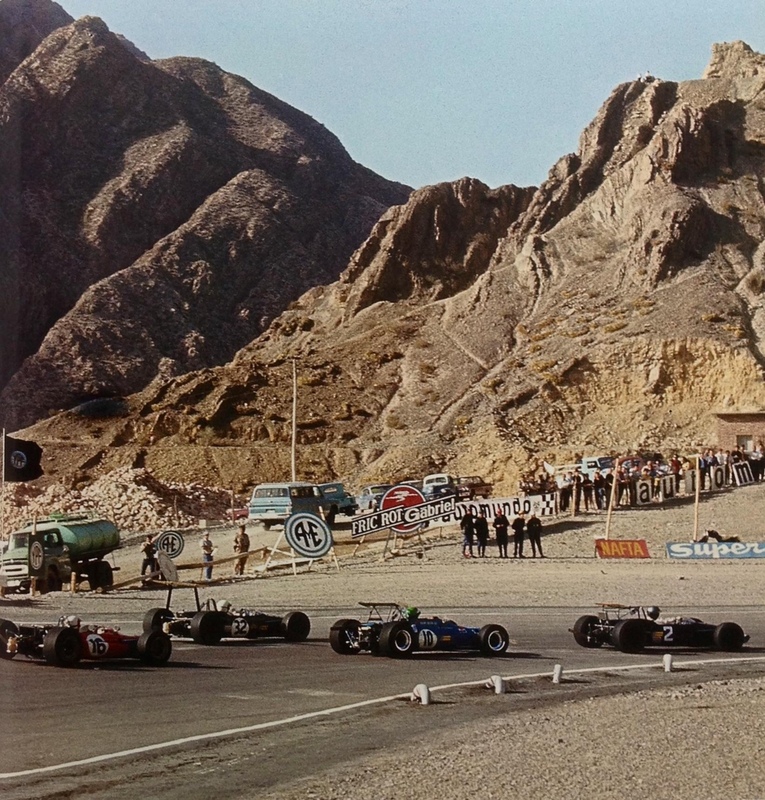 The cars in shot, all Ford Cosworth powered are Clay Regazzoni Tecno 68, Allan Rees Brabham BT23C, Henry Pescarolo Matra MS7 and Piers Courage Brabham BT23C. 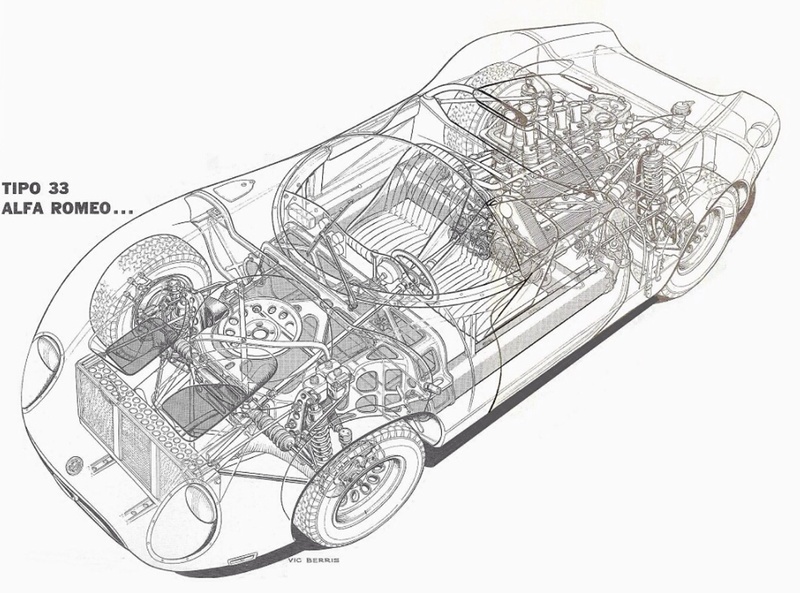 The Ferrari engine was based on a block Fiat used in its Fiat Dino Coupe, and of course later in the Ferrari Dino 246, one of my favourite road cars. 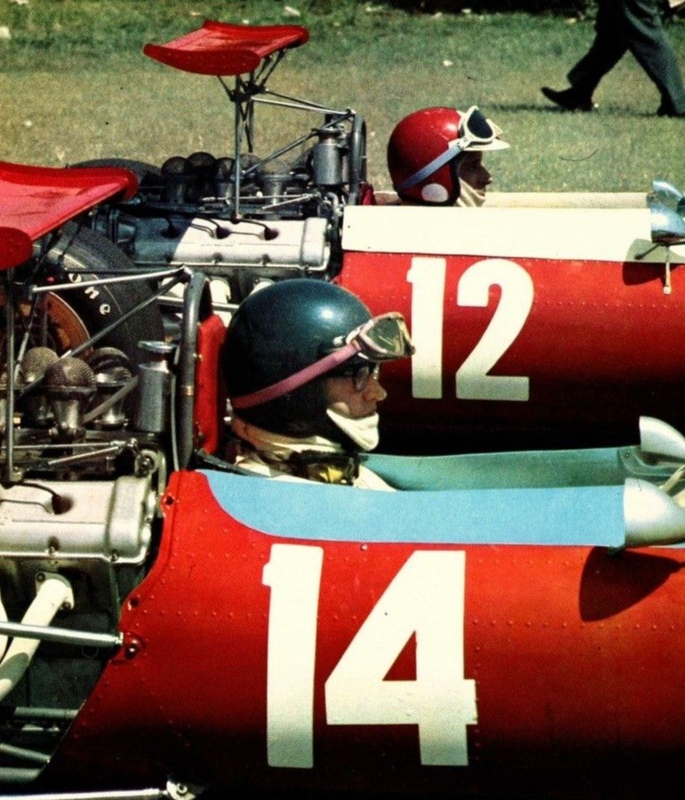 The engines evolved from 3 to 4 valve heads between 1967 and ’68 finally finding form in the ’68 European season ending round at Vallelunga, Brambilla winning the day from DeAdamich. 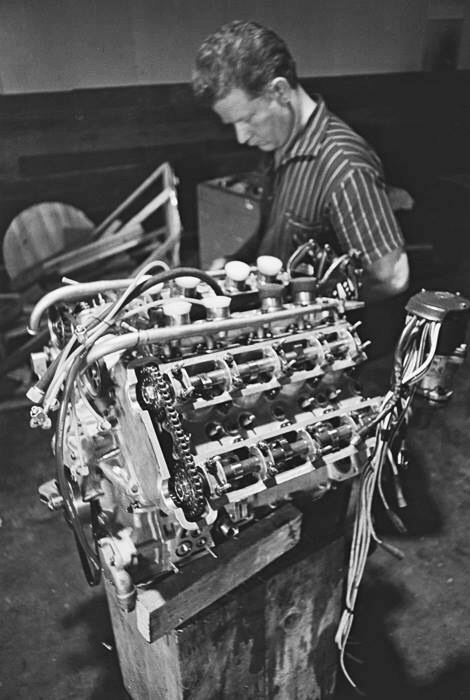 A 2.4 litre 285BHP variant of the engine was developed for the Tasman series in Australasia, that car designated the 246T. Amon won the title in 1969 and Graeme Lawrence in 1970…but that is another story to tell in detail. 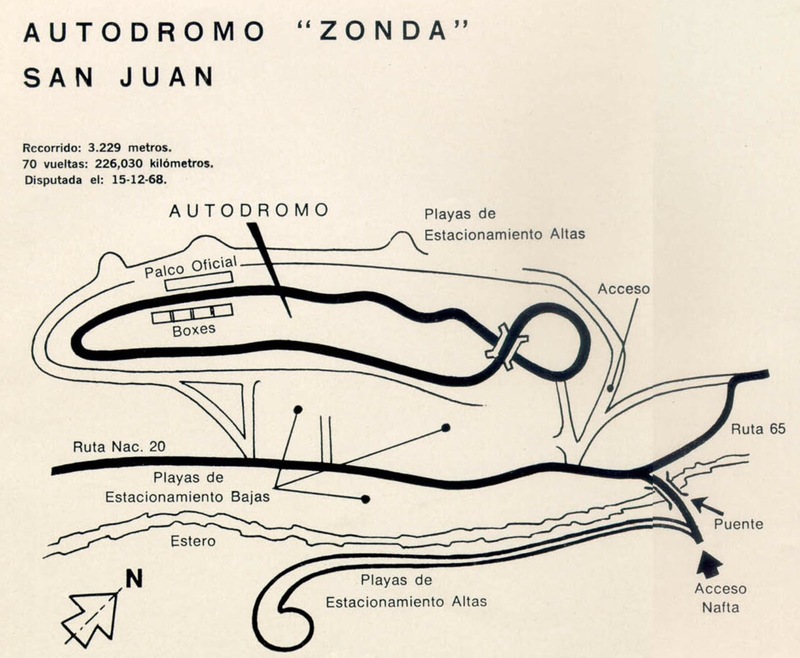 The Temporada series was held late in the year attracting the best of Europes cars and talent, the Championship in ’68 won by De Adamich, victorious in 2 rounds, from Jochen Rindt and Piers Courage.